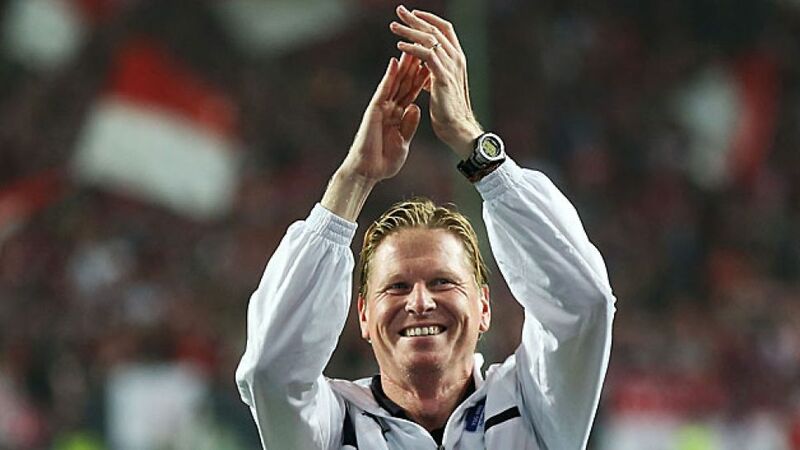 Gisdol: "Football can be unpredictable"
Sinsheim - Having saved 1899 Hoffenheim from the drop in true Houdini style, Markus Gisdol is looking forward to his first full season as a Bundesliga coach in 2013/14. bundesliga.com duly caught up with the Sinsheim saviour to find out how he got to be where he is today, as well as getting his take on the new campaign. bundesliga.com: Herr Gisdol, next season will be your first as a Bundesliga coach. Is this still something special after all those years as an amateur, assistant or a youth team coach? Markus Gisdol: Yes, it’s definitely something special for me. I always dreamed of being a professional footballer, but unfortunately that wasn’t to be. Then I put all my eggs in the coaching basket and worked my way up to the top from the very bottom. It was very arduous at times, but I’m pleased with all the experience I gained and am now looking forward to being able to work in the Bundesliga. It’s a privilege. bundesliga.com: Does the 'minor miracle' from last season help you and your team ahead of the new season? Gisdol: Our successful end to last season is certainly still in all of our minds, not only for the players. I hope and I believe that the whole region feels this tailwind and that we can take this momentum with us into the new season. But that’s not something that I as a coach can rely on. We’re starting all over again and cannot get anything for our successes in the past. bundesliga.com: After avoiding relegation, you said that you should be judged on whether your team develops over time. When would you be happy with your team’s development? Gisdol: For me as a coach, I'll never be satisfied. The game's always developing and so you can never afford to sit back. What I expect from my work with the team is that they take small steps in the right direction. I'd like to see the team putting our ideas of football into practice more and more by each game. They've got to be able to deal with setbacks and not let themselves veer off the path we're on. When I see that, then the results will be positive. bundesliga.com: So far, your focus in the transfer market has been on attacking players. You signed Anthony Modeste from Bordeaux and Tarik Elyounoussi from Rosenborg. Why have you focused on the attack? Gisdol: We want to have more variety and not be so easy to figure out. That’s why these two players are ideal additions to our squad. We expect a great deal from both of them in this sense and we’ve already seen glimpses in pre-season which confirm this. We’re already strong at the back, but that doesn’t mean we won’t act in this area. bundesliga.com: What will be the most recognisable components of Hoffenheim’s football in future? Gisdol: We want to play purposeful attacking football and be courageous. At the same time, we want to be well organised so as not to be susceptible at the back. bundesliga.com: Some people have Hoffenheim down as a surprise package this season, a bit like Freiburg last year. Is that realistic? Gisdol: I don’t know. Speculating about it is pointless. We just want to focus on ourselves to begin with and improve from game to game, and put into practice what we work on in training. If we manage that, then we can certainly cause a few upsets in individual games, but that doesn’t play a big role in my thoughts. bundesliga.com: What are your thoughts on the Bundesliga ahead of the season? Gisdol: I think the Bundesliga is going to underline its status as one of the strongest football leagues around. The quality of the football has improved enormously in recent years, thanks also to FC Bayern Munich and Borussia Dortmund who, in my eyes, will continue to lead the way in the Bundesliga. That’s got to be expected, but football always throws up unpredictable stories.